Yamaha's GHS (Graded Hammer Standard) weighted action has heavier touchin the low end and lighter touch in the high end, just like the hammersinside an acoustic piano. 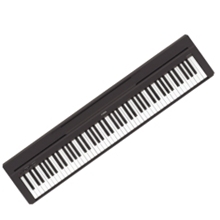 Great for the aspiring pianist, practicing onthe GHS action builds the proper finger technique for when the timecomes to perform on an acoustic piano. Plus the matte finish of theblack keys are less slippery when playing for extended periods of time. Various P-45 settings can be changed with a single button. Hold down the"GRAND PIANO/FUNCTION" button and press the keyboard to change Voices,play demo sources, configure the metronome and more.